They often say that good things come in threes, and there is most certainly some truth to it when you are presented with not one, not two, but three examples of Girard-Perregaux’s 1st quartz watch at the same time. Although the focus on mechanical watches has pushed away much of the history of quartz watches, it should be approached with equal passion. Quartz watches have done more for Swiss watchmaking than just break it off to the ground so that it could rise again to an seemingly unbound Renaissance of mechanical watchmaking, they also form a part of its history. The story how they became a part of watchmaking history is an intriguing one. Before the quartz watch was introduced Swiss mechanical watches dominated pretty much the world. They weren’t of course the only watchmaking nation in the world, but they where by far the most prominent. While ruling the world of mechanical watchmaking the Swiss also weren’t blind to new developments. 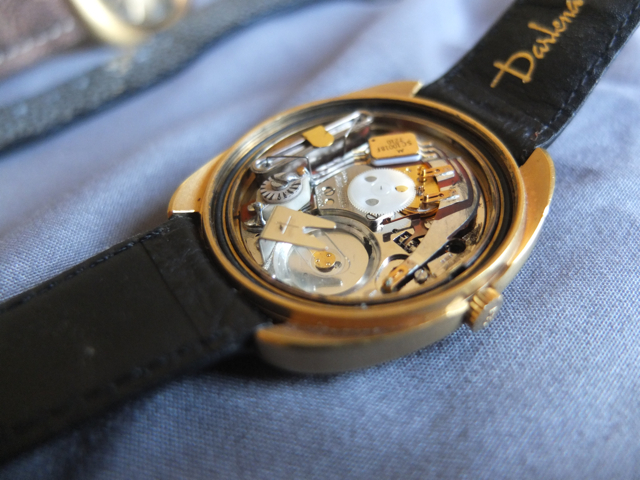 The Bulova Accutron already proofed that movements other than fully mechanical, had a future. 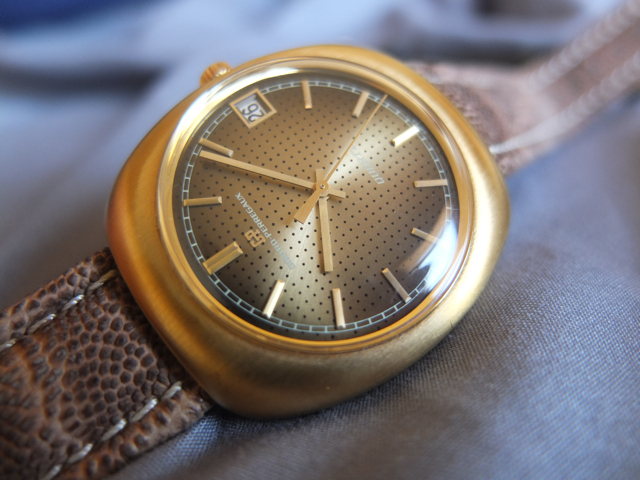 The Swiss where aware that the next step would be a fully functional quartz wristwatch, yet developing watches powered by electricity rather than a mainspring is quite a different cup of tea. Many brands joined forces in the famous Beta 21 project, that included the participation of Omega, IWC, Rolex, Patek Philippe and Piaget, amongst others. It was quite unique that Girard-Perregaux took the solo-option, and started developing a quartz movement all by themselves. Even though Girard-Perregaux was not a force to be reckoned with in mechanical watchmaking, their experience into wristwatches powered by electricity wasn’t. Girard-Perregaux tackled this problem by hiring outside help, that consisted out of the Motorola-company, which developed and made the integrated circuit for the movement, and electronics expert Georges Vuffray, who’s earlier developed quartz clock was miniaturized and formed the basis of the movement. 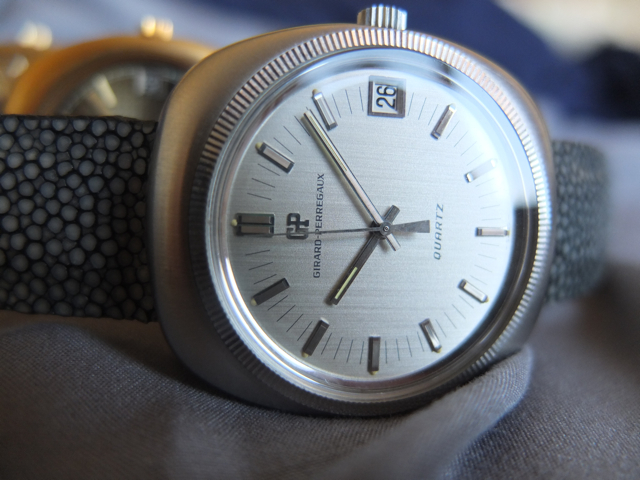 Girard-Perregaux did not beat Seiko in the quartz-race, but came out on top for which Swiss quartz movement was first available on the consumer market. Yet more importantly was the movements frequency of 32,768 Hz, which was considered the most efficient and is even today still the standard frequency for quartz watches world wide. In technical sense the movement created by Girard-Perregaux wasn’t all that different from the Beta 21, yet the execution was less complex. This was perhaps also the reason why Jaeger-LeCoultre selected Girard Perregaux’s movement to be fitted in their MasterQuartz collection. A quite unusual situation indeed because since when does Jaeger-LeCoultre take the backseat in movement development? 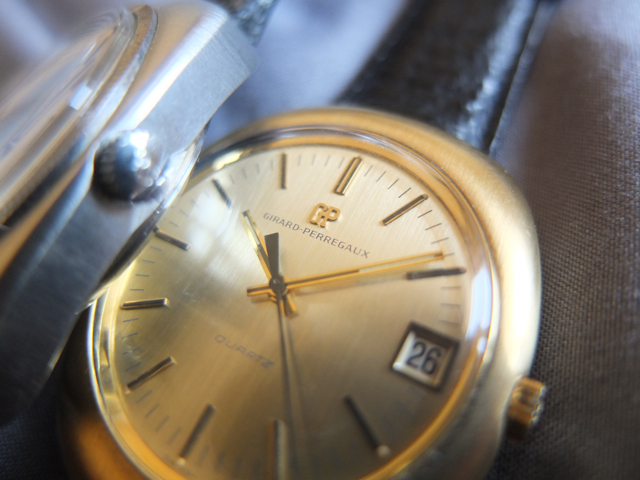 Nevertheless, did the quartz movement by Girard-Perregaux have a longer life than the Beta 21, which was very soon abandoned by most of the participating brands, often in favor of developing their own quartz movement. For Girard-Perregaux it marked the beginning of a long legacy into manufacture quartz movements. Since Girard-Perregaux produced around 20.000 watches featuring their first quartz movement, they are not extremely rare, nor exceptionally valuable, seeing three of Girard-Perregaux’s first quartz watches at the same time is somewhat of a rarity. Their design is typical for the 1970’s, with a large case and no visible lugs. That large case was partially a necessity since the quartz movement was not small, neither in height nor in diameter. For some of their models Girard-Perregaux offered a bezel that is somewhat reminiscent of the fluted bezel Rolex is so well known for. The dials where quite plain and straight forward in most cases, yet close examination will reveal a very fine linear brush, that plays subtle with light. 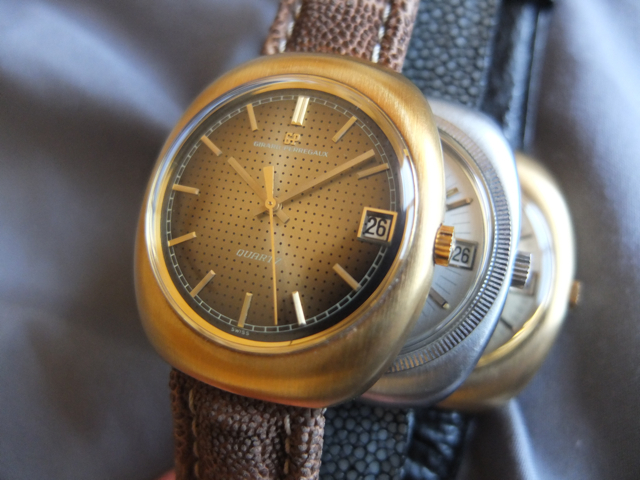 However, not all of Girard-Perregaux’s models where that timid, take a look at the gold plated version with brown/gold dial that seems to have holes in them, which are actually black dots. 70’s now-over-the-top drama extraordinaire, but in such a way you got to love it! Living with one of these watches is also quite unlike any other quartz watch. First of all they take a battery about twice the thickness of any modern day quartz movement, and the owner of these watches say that they drain them within a year (although age also might have something to do with it). While setting the time gives you the same feeling as a modern quartz watch would, changing the date is a whole different story. A loud click is audible every time you click the date over, a sound quite similar to that of those old clocks with the little plastic tabs that fall down to form a new number. That is not the only thing that is loud, because when the watch is operating, the tick from the seconds hand is far more noticeable than with most modern day quartz watches. This probably has also a lot to do with the fact that there is a lot of empty space inside the case, despite the volume of the movement. So even when you are not looking at your watch, there is still the sound that tells you what a unique piece of watchmaking history you are wearing!